This is turning out to be a little like the Costa Rica Trip, birding every day! I do not mind, today has been fab. We set off back towards Corkscrew Swamp, but turned down Shady Hollow Lane just before it. The road down to the rookery was teeming with birds of all sorts and we managed to get a much better kingfisher picture. Not one of it fishing I hasten to add, that is for another day. However, the trip through the reserve was not too good. Geoff and I have decided that the places to go are where there is areas of open water. The big birds cannot land in the wooded areas. But we did have a lovely long walk on a very long boardwalk through the swamp. After this we headed back to Corkscrew Swamp proper. I was not very happy with my pics of the baby anhingas on the nest and, as we had a free ticket for entry, we went back to have another go, this time with a monopod. Much better and I have replaced the pic from yesterday. Not only did we get better pictures but yesterday we thought she had one chick, she has three! How they all stay on the nest I will never know. We were there for ages and they performed beautifully. When she came with food I have never seen a bird put its head so far down it's parent's throat to get it. We also had a real treat. 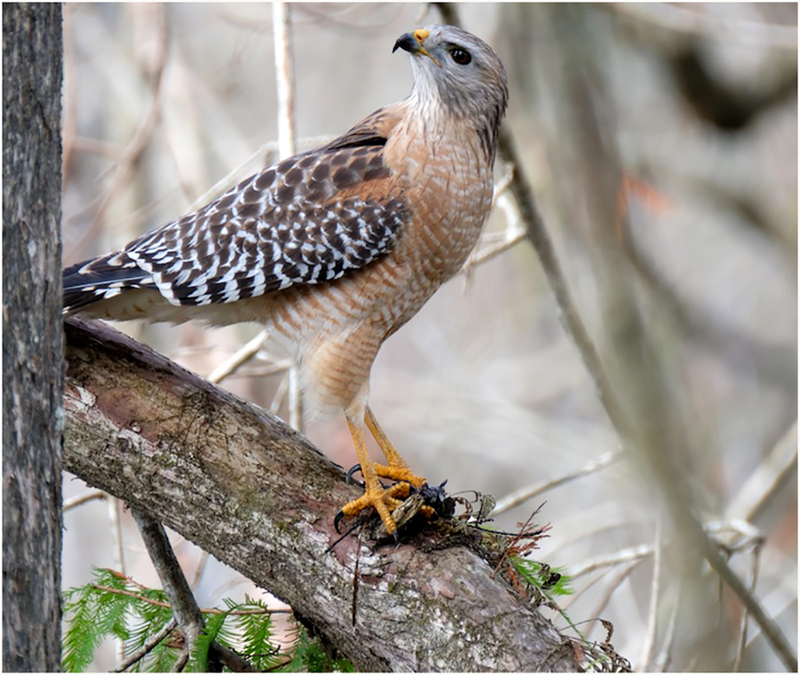 The red shouldered hawk shown here turned up. It landed on the ground, which I was told, is very rare! Also, apparently it does not normally eat fish but an Ibis had caught a fish that was too big for it and it stole it and took it up into a tree to eat. It was all going on in the same bit of open water. If I lived here I would want a season ticket. On the way back we went to the Hobby Lobby, a far grander and much better stocked version of Hobbycraft. It was wonderful. I have bought loads of stuff for our beading and all at half price. It would have cost at least three times as much in the UK. This evening has been interesting. We decided to eat at the Mexican restaurant which is just the other side of the main intersection near the hotel, and therefore decided to walk! Americans do not walk! People looked at us as though we were mad. I have never waited so long to cross a road. The return trip was just as adventurous. Tomorrow we are going to try to track down the burrowing owls. For all you non bird watchers - sorry!